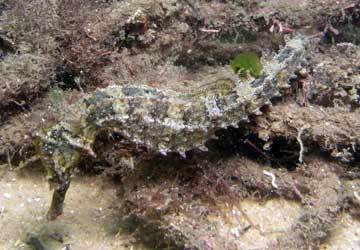 "Pregnant male sea dragons can be seen from July to December"
On the southern side of Sydney Harbour there are a number of excellent night dive sites, the best of which are Camp Cove and Parsley Bay. Despite claims to the contrary by PADI's AWARE column in an issue of DIVE Log in the early 1990s, Parsley Bay is alive and well. It has excellent macro life as well as some larger fish. 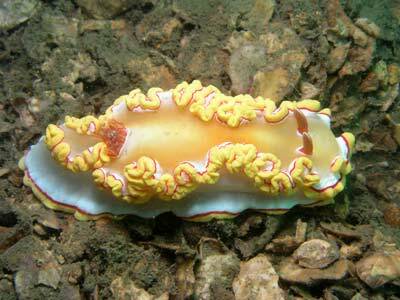 Whereas Camp Cove is also a very good day dive, Parsley Bay is really more suited to a night dive. Located in the exclusive eastern suburb of Vauclause, Parsley Bay is a longish inlet that has a swimming enclosure formed by a net strung across the middle of the bay. Near the net is a wharf from which you begin your dive (outside the net). Ten kilometres from the City, Parsley Bay is accessed by following New South Head Road through Rose Bay until you meet Hopetoun Avenue. Drive past Parsley Bay Reserve and turn left into The Crescent until you see the reserve again. Park at the far end of the reserve next to the green electricity sub-station. Gear up and walk the 100 metres down the pathway (that starts next to the sub-station) through the reserve to the wharf. Note: The shark net is removed during Winter (June to September), an act of environmental vandalism by Woollahra Council! It should be left in place. Enter the water by doing a giant stride off the lower steps of the wharf. Start your dive by dropping straight below the wharf. It is extremely silty at this site so it is important to maintain neutral buoyancy and not to "bottom graze". The depth under the front of the wharf is five metres and you should almost certainly see a number of common or White's sea horses. Look on the wharf piles as well as on the kelp on the jumble of rocks and discarded items in front of the wharf. You will also see pygmy leatherjackets in this area as well as spider crabs and sometimes decorator crabs. Note that when I dived here in 2006 and 2007 I did not find any sea horses under the wharf at all. I have also seen some very large moray eels here. After looking around this area, head to the north-east and then follow the reef edge to the north. 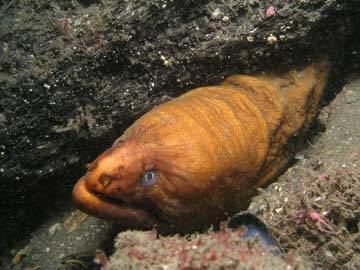 Look in the cracks and small overhangs, you can often see moray and conger eels. Also check the kelp and rubbish along here for sea horses. Occasionally, drop deeper away from the reef and look at the small scattered rocks which have some sponges and kelp attached and which protect fan-bellied, yellow and rough leatherjackets. Look carefully on the kelp and sponges and you will might also find more sea horses. All these are White's sea horses. As well, the sandy bottom is interesting being home to flathead, stingarees, sole, flounder, numbrays and other less common fish like tiger pipefish, dwarf lionfish and smooth flutemouths as well as the rarer blue-ringed octopus. As you get further away from the wharf, the bottom becomes sandier and less silty. After 20 to 30 minutes (depending on if you are travelling slow or fast) at a depth of 10 to 12 metres, you will come across the remains of what looks like a crane. This appears to be a small crane that was carried on a barge. Today, it lies on the sand and is covered in some very nice growth. Go up into the shallows and you will see pylons of a number of wharves. Under the wharves there is usually excellent fishlife, with heaps of large bream and luderick. In August 2011 I saw a large Admiralty anchor here. Despite many dives at this location, I had never seen it before. Has it always been here? From here, drop deeper (in a westerly direction) away from the reef till you reach the flatter and sandier bottom. Here you will find a number of boat moorings and other items. 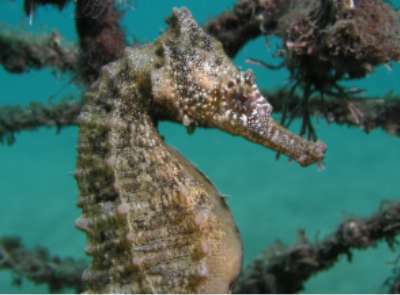 Sea horses can sometimes be found on the moorings and octopus and cuttlefish under the mooring blocks. Return to the wharf along the bay's bottom. By heading in a southerly direction you will come back to the wharf area. If you go west-south-west you will end up right in the south-western corner of the bay (well, at least up against the net). If you miss the wharf you will meet the netting. Either way, follow the net to the right for a while before returning to the wharf. 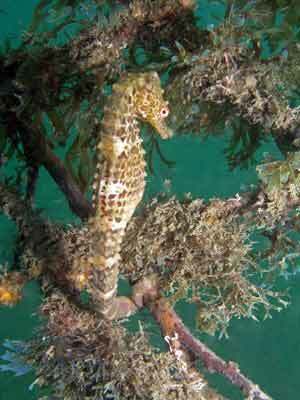 In March 2004 I found quite a few sea horses on the bottom section of the net. One of these was only 15 mm long and another two were about 30 mm. In March 2007 we found six sea horses including another one only 15 mm long. Spend some more time under and in front of the wharf looking for more sea horses. Other fish to be seen on this dive include bream, sand whiting, Sydney cardinalfish, striped dumpling squid, old wife, red and magpie morwong, Port Jackson sharks and surgeonfish. I have even seen sea hares on occasions and almost every dive will have you encountering squid, both very small 10mm babies and larger adults. I have also seen a number of juvenile painted sweetlips on this dive. To exit the water, surface in front of the wharf and clamber up onto the lowest step or the wharf cross-member. The visibility at Parsley Bay is never really great due to its location in Sydney Harbour, but even five metres makes it easy to see the great fishlife as well as make it easy to find your way around. I have had 10 metres on one occasion. One thing that can really make a dive here different is the phosphorescence which seems to be of a magnitude unlike any other site I have ever dived. At times you can have your face literally alive with light as the microscopic creatures strike your mask. Buddies look like they are surrounded by a all-enveloping halo as the glow follows them around. At least once during a dive here you should turn off all your torches to see the display. On Saturday 27 September 1997 I did a night dive here and saw more than 20 sea horses, most of which were on the sponges and kelp away from the wharf. An excellent dive. However, on 3 June 2000 I dived here and only saw five sea horses, on 6 June 2001 only three, on 1 Sepember 2001 only one and on 6 March 2002 five. On 23 March 2004 I only found one under the wharf and about six on the net. 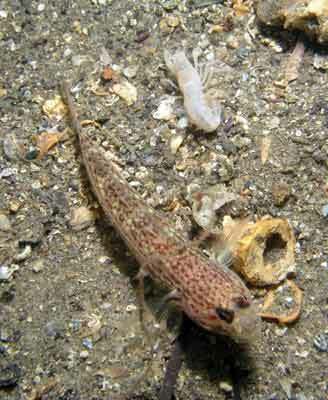 On a night dive on 8 July 2004, I saw at least 20 near the wharf (the net was missing). NOTE: On 4 June 2006 I saw no sea horses at all at this site but in March 2007 we saw six and August 2011 three under the wharf! This used to be the second most reliable place in Sydney to find sea horses. However, now I would suggest sticking to the northern side of the Harbour if you want to see your first sea horse (Clifton Gardens and Balmoral). I used to take overseas visitors here so they could experience these fantastic creatures. They were never disappointed. However, now I would go elsewhere. This site is best as a night dive.